This Saturday, 10 November 2012 is the 237th birthday of the United States Marine Corps. It’s always a special day for me. Here’s a little about why. “The Marines Are Looking For A Few Good Men.” “The Few, The Proud, The Marines.” I remember seeing these slogans on billboards early in my senior year of high school. Didn’t pay much attention to them. The draft had just officially ended and I was relieved, with no plans at all for the military. I did think that was one sharp-looking dress blues uniform. And after all, I liked to look snappy. Still do. As the school year and my time in high school approached an end, I finally gave some thought about what I would do afterward. My grades were solid but college was never mentioned by my counselor. Most guys from my school were aiming for good-paying jobs at one of the many local steel mills. I considered college but there was no money for that. Somehow, getting dirty and working in the cold didn’t appeal to me. The phone rang in May, 1974. It was a Marine recruiter. He asked if I wanted to go to college. I asked if I could get one of those chick-magnet uniforms. It all sounded like a good deal to me. Be one of those “few good men,” get a great uniform, and go to college for free. The cake pan (didn’t want to say “pot,” just too common and not all that logical) was sufficiently sweetened. I signed on the “delayed entry program.” I was 17. That September, I went to USMC boot camp at the Marine Corps Recruit Depot, San Diego, California. I had never been so scared. The first words out of my platoon commander’s mouth to the 80 or so of us were, and I quote, “I HATE every one of you! As far as I’m concerned, you are communists sent here to mess up my Marine Corps!” He spent the next 12 weeks proving to me he meant every word (I do think he sort of warmed up to me at the end). Since chapel services were the only times we could get away from those drill instructors, I ended up becoming Protestant and Catholic in boot camp. I often went to both. I got a kick out of watching the chaplains’ assistants pull a chain to slide the crucifix in for Catholics, then pull the chain again to replace the crucifix with a plain cross for Protestants. Ecumenicalism in action. How magnanimously tolerant of me. One recruit asked if he could sue the government for his mistreatment by the drill instructors. And another one formally requested to see the Commandant of the Marine Corps for the same reason. “You want to see the Commandant, Private?” boomed the D.I. “Sir, yes, Sir!” the private squeaked with all the courage he could summon. “THERE HE IS!” the D.I. yelled with power sarcasm and a dramatic pointing to the Commandant’s portrait on the wall in the squad bay. “YOU HAVE SEEN HIM! NOW ON YOUR FACE, MAGGOT!” That meant push-ups until bodily movement was no longer possible for him. Incidentally, maggots were the insect label of choice used by Marine drill instructors when they got in touch with their feelings, wanted to express how they felt about us at a given moment, and provide for us a tangible physical reference illustrating their extreme displeasure. Actually, it was effective communication. Private Bladdercontrol requested permission to make an emergency head call. “Emergency, huh, Private?” the D.I. roared. “Okay. Go! And since it’s such an emergency, you better make a sound just like an ambulance all the way there and back and I better hear you!” There went Private Bladdercontrol, wailing his impersonation of a siren at the top of his lungs, trying to run while working on maintaining a wetness-free traverse. I had to wait another seven weeks to laugh. Two other recruits just went over the fence to try to escape. So tempting, it was. The San Diego International Airport was right next door. They had planes there and we could see them. Other recruits were with us one day and just up and completely gone the next with no explanation. Spooky! I admit that every morning, I looked out the window to see if the American flag was still flying because I could not believe they were getting away with what they were doing to us here in the Land of the Free. Couldn’t even get a drink of water without asking for specific permission. Still, there was some fun. Being me, I got in trouble for smiling on several occasions, usually when we were about to eat duck. No, I wasn’t smacking my lips and salivating about some deliciously prepared waterfowl feast. “Eat Duck” meant duck in and duck out of the mess hall in five minutes or less. Still, it was mostly food, and I smiled. Mistake. “Marines have nothing to smile about,” I was lectured as I did push-ups until my arms ceased to function. And then there was the day we were learning Marine Corps rifle squad tactics and war games. It had been very hot and dry in San Diego so we weren’t able to use the normal ammunition blanks because of the risk of brush fires. 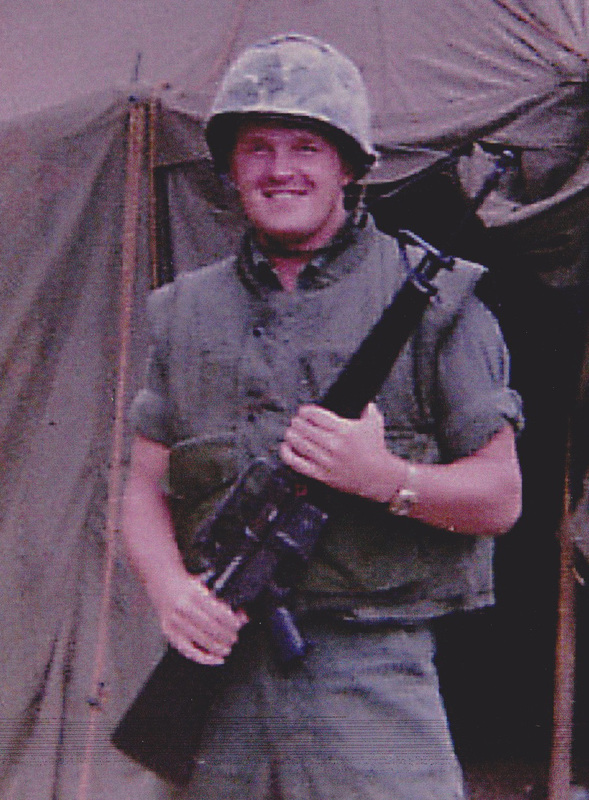 Instead, we United States Marine recruits had to run around with our M-16 rifles yelling, “Bang! Bang! Bang!” Even in the midst of the tortured anguish of bootcampedness, I appreciated the ridiculousness of that scene. You know, the pugil sticks even looked like some fun at first. Big clubs with thick cylindrically shaped padding on each end, these were designed to simulate bayonet fighting without actually slicing into one another. Downright kind of those D.I.s to forego the real bayonets. Bouts were a couple of minutes long in the first round. I was in line, wholly intent on making a good showing (I had earned and lost a squad leader position by making a “column left” when the order was “column right” earlier that day). Whoops. Needed to make up for that and stay out of the sand pit. Anyway, I looked at the other side of the ring where our opponents were lined up. I counted down to find mine. There he was. A little fella. Now I was really excited. I was going to make that puny rascal wish he had joined the Air Force! I was dancing a manly war dance and uttering primeval death growls. Out came a piercing “Oooorah!,” that distinctly Marine expression of unshackled enthusiasm. I turned around to get my helmet buckled on, then spun back and dashed into the ring like Rocky Balboa going after that bad steroid-infused Russian who killed Apollo Creed. I was facing a Rottweiler and it was definitely a stretch to call me a Doberman. Maybe I was a Beagle with anger issues. Private Rottweiler was a full head taller than me and much beefier. My souped-up spirit leaked out like a water jug jabbed with a Kabar (a Marine’s knife of choice). I sheepishly landed something like the first blow. Private Rottweiler responded with one that knocked me off my feet. I tried in vain to get up, each time drubbed to the ground with a powerful sock to the head. For the next 60 seconds, I was beaten like a rented mule (while I usually try to avoid clichés, I happen to really like the mule one. Just wanted to let you know I know. Now back to the story). My brain was spinning…stuck on an image of a Bugs Bunny cartoon (my world view has been at least partly shaped by Looney Tunes cartoons…especially my understanding and appreciation for classical music). In my mind, I saw Bugs, stinker that he is, asking a rather slow Pete Puma how many lumps of sugar he wants in his tea. 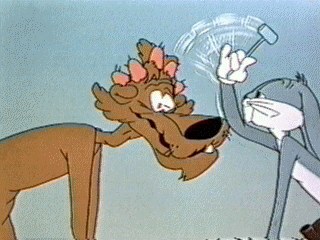 When the naïve puma says, “Oh, three or four,” Bugs complies with lightning quick mallet blasts to Pete’s head. I was living that scene. When the whistle finally blew, I crawled out of the ring into the “dead” pile and felt like it. I redeemed myself an hour later. 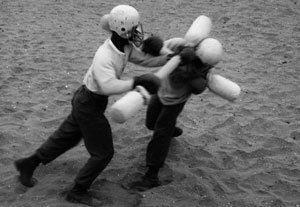 The drill instructors were now stopping bouts after what they judged to be “killing blows.” As I got ready to go back into the ring, they took my pugil stick away and handed me an 18” long rubber hose. Told me it was a knife! Great. Ready for another pounding, I went in. My opponent tried to club me but I grabbed and pushed the end of his pugil stick down with my right hand and with my finely tuned left hand, jabbed him hard in the gut with the rubber pseudo knife. Victory! The drill instructors yelled, “Where you from, Private Boggs?” I said, “Sir, Chicago, Sir!” “That figures,” they said. Ha! Sweetness from the streets. Sort of. Boot camp was situated next to the San Diego airport and also next to the United States Navy boot camp. The Navy one was several weeks shorter than ours and they got days off, a fact we enviously noted. One Sunday, we were marching in formation as usual, this time down the road right next to the Navy base. There we were–hard at work. Right over the 12-foot tall chain link fence were those off-duty Navy squid recruits eating Twinkies, drinking Fanta Grapes and laughing at us. Our drill instructor gave a quick “Platoon, halt! Left face! AAAAATTACK!” 60 or so Marine recruits charged the fence and began climbing, screaming like gung ho banshees. Squids scattered faster than if they were shot out of a cannon on one of their boats. This was the one and only time a Marine drill instructor and recruits smiled together during boot camp. Then at the end of the 12 weeks without a day off, they allowed us to attend a movie at the base theater the night before graduation. Keep in mind the 40 of us who were left had not seen TV or entertainment of any kind or eaten anything but Marine Corps chow for 12 weeks. Guys piled candy high in their laps. I think I had at least one of everything myself, including my favorites…M&Ms (plain and peanut), Snickers, Hershey Bars, Tootsie Rolls, Reese’s Cups, Milky Ways, and some popcorn floating in extra butter just to keep it all healthy. There was one catch. We were not allowed to laugh at the cartoon or the movie–a comedy. Not one chortle or guffaw (no, the Marine drill instructors actually did not know those two words but I did and if I hadn’t used them, you wouldn’t know I knew them). I think the movie was called, “Spies.” If we laughed, we had to leave. Brutal. But again, I appreciated the backwards humor of it. I saw the whole movie and laughed myself to tears in my heart. Through my time as an active-duty Marine, I gained confidence and a huge sense of accomplishment. 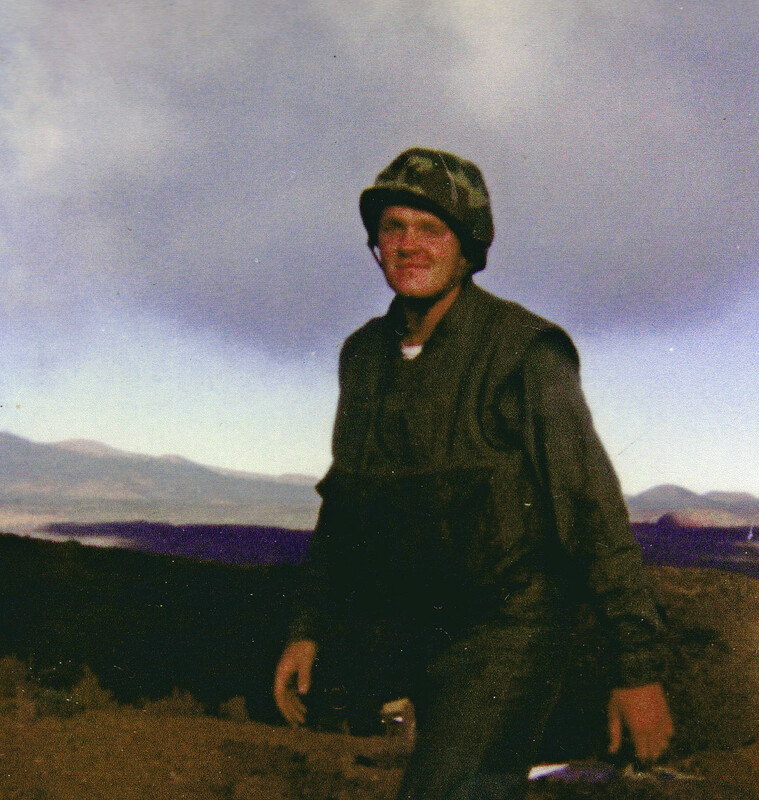 I served for three years, stationed with the 1st Marine Division at Camp Pendleton, California and the 1st Marine Brigade at Kaneohe Marine Corps Air Station in Hawaii. I served under Lt. “Wild Bill Up-The-Hill-Twice” Jackson and a company commander with a glass eye featuring a gold Marine Corps emblem in the pupil among others. I also proved I was a “Hollywood Marine” (a somewhat less than gracious term applied to those of us who went to boot camp in sunny San Diego instead of sand flea-infested Parris Island, South Carolina) by being assigned to appear in a Hollywood movie as an extra. The movie, “Baby Blue Marine” starring then-popular Jan-Michael Vincent wasn’t very good but being involved in the shooting of it for three days was great fun. Helping resettle Vietnamese refugees (after the fall of Saigon) into Camp Pendleton tent camps was a highlight for me, too. In the Marines, I found out I can endure a great deal of physical and mental difficulty. I earned a title and joined a brotherhood I will have for life. And God changed the course of my life by my involvement with a Christian ministry called The Navigators while on active duty. I also discovered an outlet for the patriotism that was first stirred in high school. Later, I went to college completely funded by the G.I. Bill. I am grateful to the United States Marine Corps and the United States of America. Yes, Saturday is the 237th birthday of the Marine Corps. And Sunday, 11 November is Veterans’ Day. Would you take a moment to ask God to protect the men and women of the Marines and all services who are still in harm’s way? Thanks. Semper Fi and happy birthday, my Marine brothers and sisters! Hey that’s great! I knew some of this but not all of it!